The Duty desk and Talent Acquisition Team annual fundraising coat drive has been hugely successful once again thanks to people opening their hearts and closets to benefit those who need it most this winter. 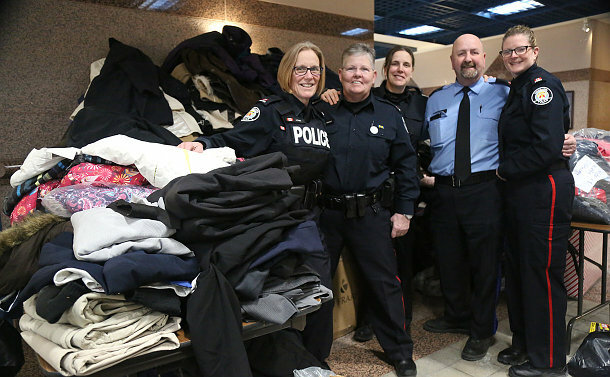 This year Toronto Crime Stoppers stepped in and donated winter coats to the cause. Nearly three hundred coats were collected during the two-month drive. “We encouraged employees to bring coats they are no longer using and that are lightly worn and in relatively good condition,” said Const. Joanne Tawton. The coats, sorted by gender, were bagged on January 31 and delivered to local shelters. They included Sistering, the Salvation Army, Women’s Residence, Scott Mission and Covenant House. This is the campaign’s seventh year. “Every year, the response is getting better from both uniformed and civilian members,” added Tawton.